Revolution Software and Ravenscourt have launched Broken Sword 5 – the Serpent’s Curse on the Nintendo Switch eShop for USD29.99 today. To celebrate, both companies have put out a brand new launch trailer. 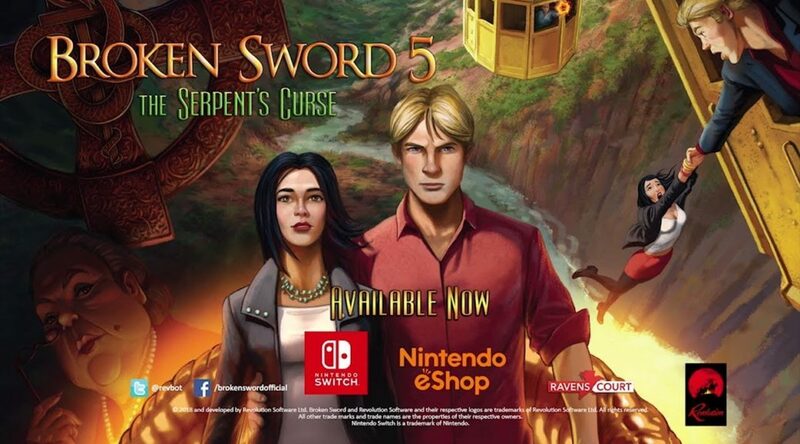 ‬Revolution Software and Ravenscourt are delighted to confirm that Broken Sword 5 – the Serpent’s Curse has launched on Nintendo Switch. Priced at $29.99, the game is available as a digital download, and features never-seen-before Behind the Scenes movies and an innovative new user interface. Paris in the spring. Shots ring out from a gallery. A robbery – a murder – and the beginning of another epic original Broken Sword adventure. An adventure that will hurl intrepid lawyer George Stobbart and sassy journalist Nico Collard onto the trail of a murderous conspiracy whose roots lie in mysteries older than the written word. Armed only with logic, integrity and a wry sense of humour – can George and Nico outwit evil forces both ancient and modern and save mankind from disaster? The game includes full HD 1080p graphics so it looks great either on the device or when scaled up to be viewed on a television. There are also Behind the Scenes movies created especially for the Nintendo Switch version: unlocked as play progresses, these videos reveal the story and the development process behind the game, through previously unreleased interviews with the Broken Sword team. This enhanced edition also features a re-imagined user interface designed to take full advantage of Nintendo Switch’s functionality, allowing players to seamlessly switch between Joy-Con and touch screen play. Mixing cerebral puzzling, sharp wit, with historical authenticity and intrigue, Broken Sword 5 – the Serpent’s Curse has secured its place as a favorite with fans of the series, whilst also winning over a new generation of players.